Not often are meetings described as “great” but Water for Riley volunteers agreed. That was a great meeting on March 9, 2017. The coordination team gathered to discuss how to build and install the drinking fountain, Reflecting Blooms. Setting the tone, Michelle Reid summarized Riley Park’s importance as Calgary’s best example of an historic cultural landscape. In other words, Riley Park is very distinctly of its time, 1910 and 1920s. Riley Park would look quite different if it were a modern park. Thus, the City does not want Riley Park to look like an ordinary park. Riley Park must be distinguishable yet compatible with and subordinate to the landscape of rolling hills that mark Calgary’s natural features. Wow, that’s a demanding framework Water for Riley must respect. Fortunately, the jury’s choice of winning design does that. As Michelle Reid concluded, ““It’s amazing that the students were so successful in designing their drinking fountains, considering how complicated intervening in historic landscapes can be.” Michelle’s comments made Water for Riley very proud of the ACAD and SAIT student designers. With that context, the experts from IBI Group and Heavy Industries coordinated the work to be done. There’s an early phased plan to obtain approvals, create preliminary drawings, and prepare design templates. The processes to fund raise, build, and install the drinking fountain are tentatively mapped and the first round of tasks assigned. Michelle Lazo, the winning designer, will have the opportunity to work with these wonderful experts as part of her award. Together, they will turn her designer’s concept into a reality. To be part of this exciting project, call 403 862 1923. Help build the drinking fountain so that the future looks like history in this unique, historic, natural jewel. Click the link and let the Parks Foundation know you want your donation to go to Water for Riley. At the Big Reveal on 18 January, people asked what inspired the idea of Water for Riley. 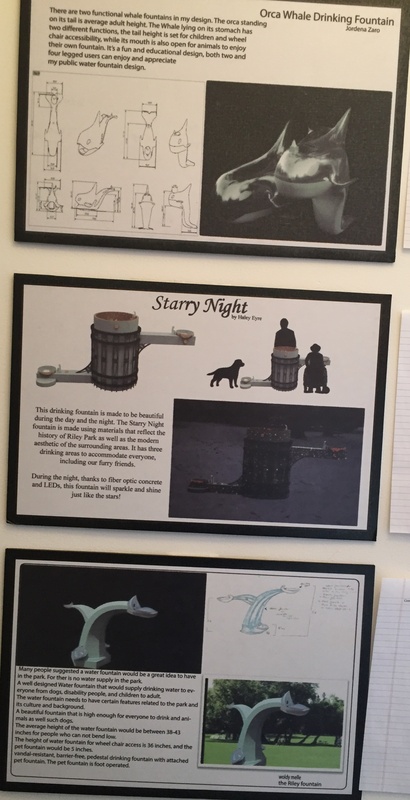 Here’s how the concept of a student designed drinking fountain in Riley Park originated. In summer of 2010, a White West-highland (Westie) puppy named Trail was 11 weeks old and just adopted into a Hillhurst family. Trail at 11 weeks old. While walking in Riley Park, Trail let it be known he was thirsty. Very, very thirsty. With typical “Westitude” (the Westie breed is famous for attitude), Trail demanded water. When he wanted something, he was as ear splitting loud as a shrieking child. Trail and his humans had to forego the rest of their walk. Partly to get water and partly because other park visitors looked at Trail as if his terrible humans were abusing him. This experience had us think – if a puppy got thirsty enough to stop a family’s outdoor activities, how much more important was it to keep children happy, hydrated, and healthy? We know the negative health consequences of sedentary children and the need to get them in nature. Supplying drinking water to keep them playing in Riley Park was obvious. With ACAD and SAIT so close, the idea of making the drinking fountain a community-building, student engagement project was born from that dog walk. There were many pieces to bring together in the collaboration. Slowly, it gained momentum until it’s half way to reality. Trail attended all the Water for Riley committee strategy sessions that took place in Riley Park and the student walk-around groups with City of Calgary Parks Department staff. Trail was happy to tour Riley Park with Ron from Parks Dept and student designers. Bored to sleep at a meeting. Trail’s now eager to be the first dog to drink from the Reflecting Bloom that is specifically designed at his height. And, for the record, Trail is a calm six year old who loves Riley Park and doesn’t scream anymore. To volunteer for Water for Riley call 403 862 1923. Help make the dream come true, donate to the drinking fountain in Riley Park. Designate your donation the Water for Riley project and receive a tax receipt. To donate through the Parks Foundation, click in the button and specify your contribution is for the Water for Riley project. At this almost half way point, Water for Riley thanks those who have made it possible for the project to get this far. Donors include The Calgary Foundation, Sunnyside Natural Market, Framed on Fifth, and Alberta Culture and Tourism. For your donations, thank you. Water for Riley values all its community relationships, which are as important as drinking water in the park on a hot day. All donations of $10.00 and greater get tax receipts from the Parks Foundation. Click here to donate and specify your donation is in support of the Water for Riley project. Call 403 862 1923 or email with questions and to volunteer. 2) Raising money to build the chosen design. How are we doing on both tasks? The effects have been greater than the sum of the parts. Water for Riley volunteers and partners attended ACAD and SAIT classes, ACAD and SAIT students studied Riley Park, SAIT students went to Hillhurst Elementary School, ACAD students exhibited their designs at Hillhurst Elementary School, and Hillhurst Elementary School teachers created learning modules for students to interact with the designs. The designs were displayed in five venues around the community, including at the Hillhurst Sunnyside Community Association, and This Is My City Arts Festival. Each design held enchantment for the five skilled jury members, and they debated until reaching an organic consensus. Three shortlisted designs are now undergoing professional, technical review. Water for Riley’s jury will get expert recommendations to guide its decision of which one design will be built. That leads to the second major task – fundraising. Water for Riley began in a different economic climate, so the second task is not yet half accomplished. Although there’s progress there’s also less money available for unfunded priorities like a drinking fountain near the children’s playground. The volunteer committee is working hard and smart on finding funding. Stay tuned for news. 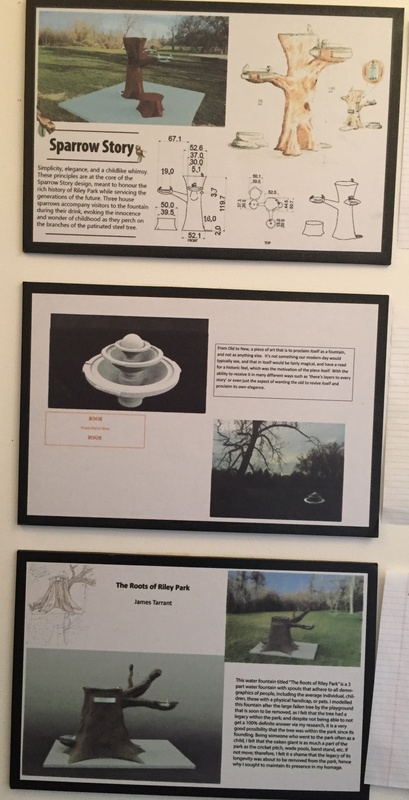 You are invited to the unveiling of the three finalists in the ACAD and SAIT student challenge to design an artistic public drinking fountain for historic Riley Park. At 2 PM, at our partner’s Framed on Fifth on June 18, 2016. Come, enjoy the festival of arts and artists. the jury makes its final selection. Help build the public drinking fountain in Riley Park . Click to donate through the Parks Foundation and specify your support is for Water for Riley. Call 403 862 1923 or email to volunteer or for more information. Be among the first to view the final three. The short list of three is now in the hands of our experts, the international consulting firm IBI Group, for technical review. the jury will make its final selection. Help build the public drinking fountain in Riley Park . Click to donate through the Parks Foundation, and specify you support the Water for Riley project. Call 403 862 1923 or email for more information. Water for Riley proudly presents the ACAD and SAIT student designs in the running for the drinking fountain design challenge. 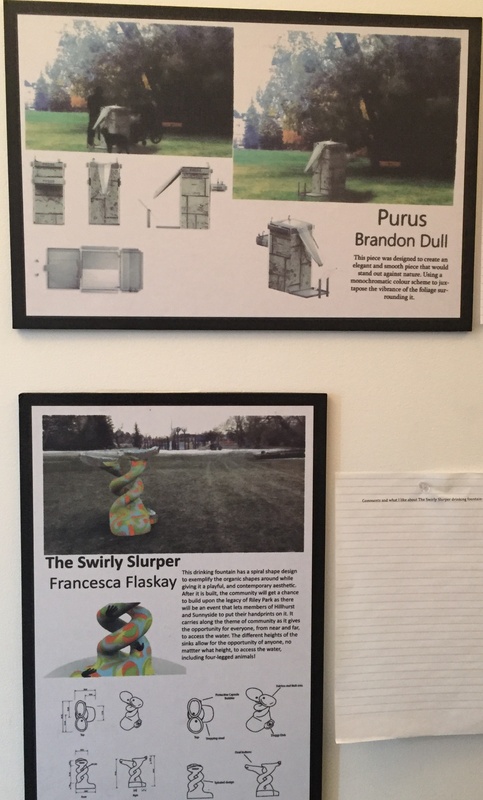 They are available for viewing and comments at Blank Page Studio until April 24, 2016. Stop by and add your comments. These photos are no substitute for seeing the whole collection in the studio space. Please visit and leave your opinions on the page beside each design. No page at Blank Page need be left blank. To participate in Water for Riley, email or call 403 862 1923. To donate through the Parks Foundation, please click the button and specify your donation is for the Water for Riley project. 1. Why didn’t the City of Calgary install a drinking fountain in Riley Park instead of this lengthy, volunteer-driven, Water for Riley process? 2. What makes Water for Riley’s drinking fountain costly? Both questions came up as the 21 amazing designs shine in the exhibit at Blank Page Studio during the This Is My City Festival from April 7 to 24, 2016. The answer to both excellent questions is similar: Water for Riley wants more than obtaining a squat concrete public drinking fountain. The jargon for our vision is cumulative impacts. A beautiful, artistic fountain was the mechanism for attaining those cumulative impacts. Now for the long answers. Why not a plain, simple drinking fountain? If we have to fundraise for a plain, simple fountain, we saw an opportunity to acquire a beautiful, student designed, drinking fountain and forge new and strengthen existing networks of relationships, establish connections among neighbouring institutions, and build community. In the past 100+ years, Riley Park’s neighbours didn’t collaborate if they had an idea to share, a problem to solve, or an interest in common. Water for Riley wants Riley Park’s neighbours to get acquainted and build social capital together. Social capital creates trust, and trusting neighbourhoods have less crime, higher energy, more caring, and better economies. Students at both Colleges admitted that, until Water for Riley, they’d never wandered down the hill to see the natural jewel of an urban park at ACAD and SAIT’s feet. 2. Budget: What does Water for Riley’s fountain cost? How much do shoes cost? It depends on design, materials, labour, etc. After our jury selects a design we’ll know. Our best guesstimate to build an artistic fountain is somewhere between $40,000.00 and $60,000.00, about double the cost of a plain fountain, not including installation costs. We anticipate incidental costs of $7,000.00 for the design selection process, $5,000 of which is for technical expertise to review the short list of designs for feasibility, durability and affordability. So far, we’ve had no (zero, nada) administration costs or incidentals. Everything has been donated; meeting and display spaces, lunches, photocopies, and time volunteered. Framed on Fifth donated the posters for all the exhibits. The wonderful Diana designed our fabulous logo, named Water for Riley, and constructed this website. Here is our still-expanding list of incredible partners. We’re very grateful for all, and hope this answers some questions. All questions, comments and offers to help are welcome. Email or call 403 862 1923. To donate to the fountain project through the Parks Foundation click the button and specify your donation is for Water for Riley.